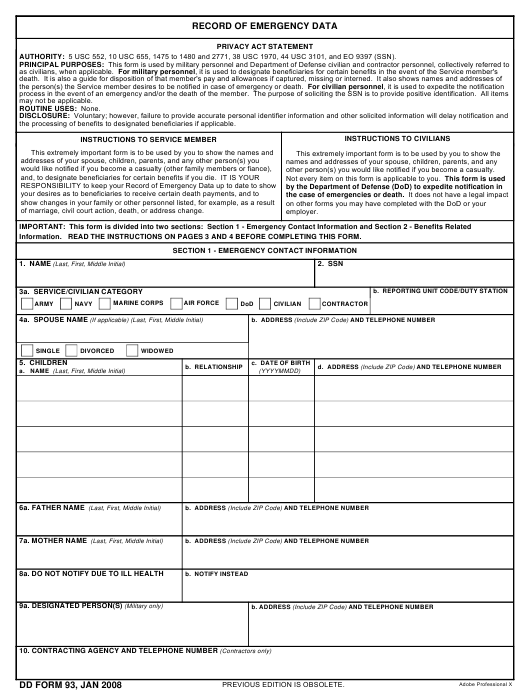 DD Form 93, Record of Emergency Data is one of the most crucial pieces of paperwork used within the United States Army. The DD 93 is a living will of sorts and is used to keep a record of any wishes a soldier may have in cases when they cannot communicate their needs because of a lethal injury, temporary disability or death. The form is issued by the Department of Defense (DoD) and serves as the advocating voice for the Soldier in cases when they cannot speak for themselves. The form - sometimes mistakenly referred to as the DA Form 93 - was last revised in January 2008. An up-to-date fillable DD Form 93 is available for digital filing or download below. What Is DD Form 93? The DD Form 93 is used to provide information about the soldier's emergency contacts, marital status, living beneficiaries and basic data on benefits paid to eligible survivors. Those filing are required to voice all of their concerns and wishes in an open and accurate manner in order for those demands to be heard and be satisfied. A record of emergency data is to be updated and reviewed annually or otherwise in case of any important life-changing events like a marriage or divorce. This procedure is not obligatory and is the soldier's own responsibility. A new DD Form 93 was issued within the framework of the National Defense Authorization Act for FY12, which states that military members can designate any person for death gratuity, remains and other benefits entitlement disregarding any kind of relationship between the soldier and the person. However, relatives must still be notified of this decision. In case of any dispute between the person receiving benefits and the state law, the preferences are always on the side of the law. Where Can I Find My Dd Form 93? How Do I Update My Dd Form 93? insuring a legible image on all copies. Include "Jr.," "Sr.,"
"III" or similar designation for each name, if applicable. mother is listed, indicate relationship. ITEM 8. Persons Not to be Notified Due to Ill Health. "daughter Susan." Otherwise, enter "None". person(s) to be notified in lieu of person(s) listed in item 8a. If "None" is entered in Item 8a, leave blank. considered not applicable to civilians will be left blank. ITEM 1. Enter full last name, first name, and middle initial. ITEM 2. Enter social security number (SSN). USC, Section 655. NOT APPLICABLE to civilians. ITEM 3a. Service. Military: Mark X in appropriate block. Person(s). NOT APPLICABLE to civilians. their contracting agency and its telephone number. personnel or human resources office. single, divorced, or widowed, mark appropriate block. applicable. If one of the blocks in 4a is marked, leave blank. the time of the person's death. father is listed, indicate relationship. ITEM 13b. Address and telephone number of PADD. required to provide notice of the designation to the spouse. Item 11b. Relationship. NOT APPLICABLE to civilians. ITEM 11d. Show the percentage to be paid to each person. standard bond paper with the information. beneficiary. NOT APPLICABLE to civilians. item is an ink entry and must be completed on all copies. parentis may be named. NOT APPLICABLE to civilians. All individuals filing must start by compiling their emergency contact information. Boxes 1 through 3 are for entering personal contact information: name, SSN, type of service or civilian category. Box 4 is for stating marital status and entering the name of the soldier's spouse if there are any. There is also an option of including a former spouse in the form. Box 5 is for listing children and their contact information. Boxes 6 and 7 are for providing the names, addresses and phone numbers of the father and mother of the individual filing the form. Box 8 is for listing the people that should not be notified in case of severe injury or death you and suggesting a substitution. Box 9 is for military only and identifies the designated military member. Box 10 provides the contracting agency - all non-contractors must leave the box blank. The rest of the boxes are for military members only: civilians finalize the form by signing off the DD 93 in the appropriate box. State all the beneficiaries in Boxes 11, 12 and 13 along with their names, addresses and telephone numbers. These beneficiaries will be entitled to death gratuity - the percentage of all the benefits each person gets must also be included. A copy of the DD 93 must be kept and added to a soldier's private paperwork file. You can get a copy of the DD Form 93 on the DoD website or by clicking the download link above. Download and file the 2008 version of form DD 93. Soldiers and civilians should then visit their unit S1 and update their DD Form 93 after they discussing it with any relatives or benefactors. An S1 is the staff member in charge of handling personnel actions.